Right off the train tracks, as its name suggests, The Railyard is a bare-bones, no-frills neighborhood drinkery that offers quick service and reasonable prices. Happy hour lasts all day Sunday, and the bar is also a partner with the Dynamo pub groups. Wear orange, have a few drinks, make some new friends with the welcoming regulars, and feel free to be as loud as you’d like. The train will drown it all out anyway. 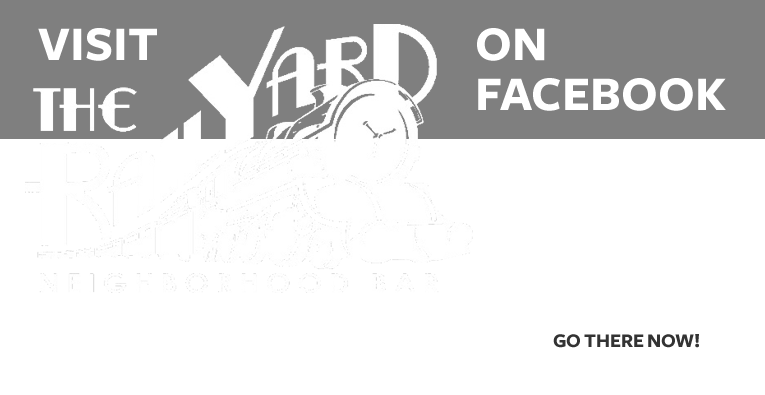 The Railyard (the bar which famously replaced the old Roll-In Saloon) is hosting a mini tap-takeover and charity event to support victims of the marathon bombing in Boston. Through the end of May, The Railyard will donate proceeds from the sale of all Sam Adams beers to the Greg Hill Foundation. Owner Trey Melcher has also promised that his family’s foundation — the Melcher Charitable Foundation — will match everything raised, dollar for dollar. The Railyard, located at 4200 San Felipe, has been named a finalist in the “Small Wonder Bar of the Year” category (40 seats and under) of the 2012 Nightclub & Bar Awards. The premier, national nightlife-industry recognition program is in its third year and culminates in the NCB Convention and Trade Show in Las Vegas each March. The Railyard was one of only two Texas venues to reach the bar finals with Houston’s Stats Sports Bar and Grill selected in the “Sports Bar of the Year” category. Austin’s Roial Eco-Friendly Day and Nightclub plus QUA Bottle Lounge were named as finalists in three nightclub categories. “It was a surprise and honor to be considered among the best small occupancy bars in the country and recognized in the company of national leaders in the hospitality industry,” said owner Trey Melcher. Selected by an expert judging panel composed of top consultants, developers, educators, writers, editors and trainers in the industry, the winners will be honored at the NCB Convention and highlighted through Nightclub & Bar media group vehicles, including leading trade publication, Nightclub & Bar magazine, and online at www.nightclub.com. Judging criteria focuses on characteristics that include quality, creativity, financial success and patron value. The Railyard, which anchors the newly renovated, Art Deco-inspired Melcher Crossing shopping center, debuted in June 2010. The venue opened following a sensitive refurbishment of the landmark Roll-N Saloon, which closed in January 2010 after 40 years in continuous operation at the same location. Great effort was taken to integrate necessary updates while preserving the character and original elements that were hallmarks of the space. Named for its location adjacent to the train tracks that separate Uptown from River Oaks, The Railyard is open daily and features happy hour from 4 until 7 p.m. every weekday. When the Roll-N Saloon closed its doors back in January, regulars mourned. The dive bar offered a low-key escape for those who cared more about hanging with friends and the old school tunes on the jukebox than being seen at an “It” bar with the see-and-be-seen crowd. Plus, the neighborhood back roads provided ample alternate routes for those hoping to avoid the more populated streets at 2 a.m. But while the Roll-N can never be replaced, former enthusiasts please take note — there’s a new kid on the block. The space is now occupied by the (aptly named) Railyard, and owned by Trey Melcher, Cody Melcher and Clinton Hedges. Trey Melcher, one of the original investors in the Red Room, saw a business opportunity when the owner of the Roll-N chose not to renew his lease. The original idea was to keep the re-modeling down to a minimum. However, after digging in, Melcher realized a major overhaul was needed. Fear not — though things have been updated, you’ll still recognize the place. The old CD jukebox has been replaced by a digital jukebox, but your old favorites by Johnny Cash, Willie Nelson and Bon Jovi are still in the rotation — just with Top 40 neighbors. And there are still some familiar faces. Tony and Marc, former staff of the Roll-N, are still behind the bar. One change no one will mind? The restrooms have been modernized and cleaned up. There are happy hour deals from 4 -7 p.m. weekdays and football drink specials on the weekends. Read the full story right here! The bar — which, along with Tex-Mex eatery Vida in the same shopping center, is owned by Trey Melcher — was formerly the Roll-N Saloon, and is one of only two bars in Texas to reach the finals. The Railyard opened in 2010 and has been a gameday haunt for nearby River Oaks neighbors, many of whom had also frequented the Roll-N in the four decades it was in operation at the same spot. In college, tech school, the circus or whatever institution of higher learning you skipped class in, you probably had a favorite haunt that became part of your shared experience. For me, it was The Den in San Marcos, a mere fifty feet from the hovel in which I resided, and just as close to my heart. I think my crew kept the place in business for three years, pumping quarters into the shuffleboard table and ordering cheap pitchers of tepid, domestic beer. Flash forward a few years and a lot has changed. Watery well drinks and cheese fries no longer sell me on an establishment. I’m glad there’s no smoking in most bars nowadays. However, nostalgia always kicks in when visiting somewhere new, and I always end up comparing the latest joint to that golden standard of my youth. Instead of weak and watery pours, The Railyard makes a strong cocktail, and their happy hour, from 4-7, Monday-Friday, brings back collegiate prices of yore. Their choice of brews on tap is small, but priced fairly. Four dollar Bloody Marys, micheladas and mimosas on Sundays is a nice touch for us after-church drinkers. Those machines that keep a constant chill and churn going on a typical margarita mix keep pretense miles away, as do buckets of Lonestar and Coors Light for $13. Service: At your old respite? Even after the 15th visit, that cute bartender you were trying to get to know still insisted on smacking gum while staring through you and mixing up your tab at the end of the night. At The Railyard, service is quick, it’s friendly and it’s not merely gushing for a tip. You don’t have to visit more than once for Tony to remember your name. You’ll remember his too, because he’ll remind you of comedian John Caparulo. Clientele and Atmosphere: When it was $2 you-call-it night back in your heyday, it was like flies to a dead horse, but having to elbow-check your date to get to your beer was never really worth it. The Railyard is slightly more subdued. Because it’s a little bit off the beaten path, the crowd that gathers is a like-minded group of Houstonians in their 30’s looking to cut loose, minus the pressure of having to see and be seen. To the background beat of freight trains thumping along on the nearby tracks, a schizophrenic juke box spits out old-school Metallica and follows it with Jimmy Buffett. It epitomizes The Railyard’s laid-back attitude. 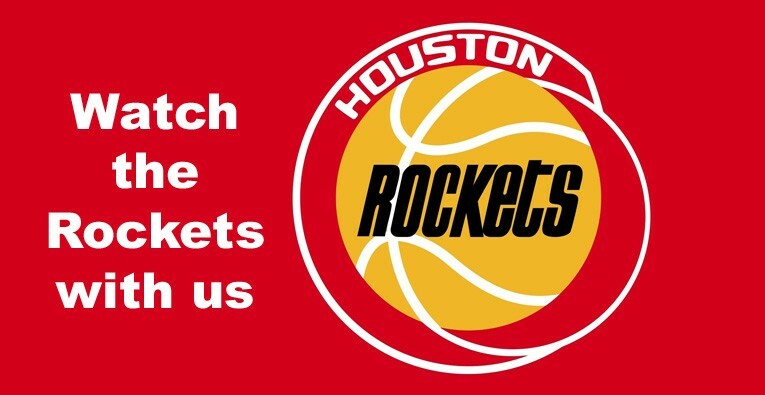 Feel like watching the game? Have at it. Feel like dancing? Dance. Feel like cuddling up in a corner with a date or hollering for a round of shots with the after-work crowd? Cuddle up or party down. Throw in all the trappings of a sports bar (flatscreens in all the right places), some arcade throwbacks (Golden Tee and Big Buck Hunter) and a photo booth for no particular reason, and you’ve got yourself a bar that feels like college, but grew up, got a job and doesn’t live in its mom’s basement anymore. A genuine neighborhood bar. Being thirty-ish is strange. It leaves you feeling stuck in that purgatory of being old enough to know better, but still too young to care. And while the memories forged at your old stomping grounds can never be replaced, they have less to do with the bars themselves, and more to do with the people, conversations and wild times associated. 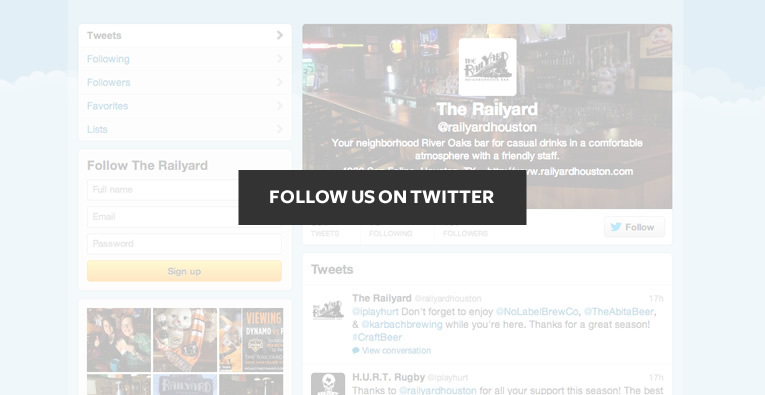 The Railyard is right there with us. For all its college charm, it exudes an undeniable wisdom, reminding us of the journey that was, but that the best is yet to come.